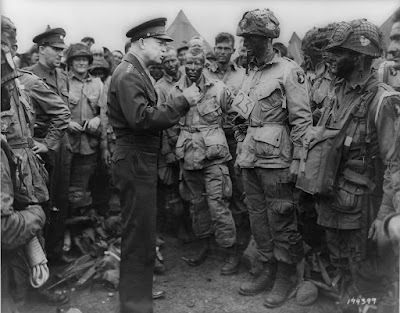 Army Gen. Dwight D. Eisenhower (seen in the below photo), the supreme commander of the Allied Expeditionary Forces in Europe during World War II, spoke these words to his troops before the Battle of Normandy on June 6, 1944. Note: In the top U.S. Air Force photo a U.S. Air Force C-130 Hercules aircraft flies above the Normandy American Cemetery in France on June 3, 2018. The photo was taken by Airman 1st Class Joshua Magbanua.